As the holiday period begins, the team at Seaventures near Sipadan are really excited to be welcoming all of our valued guests and friends. We love sharing this time of year with our guests. For many, this time of year is an opportunity to get away with loved ones and friends, unwind from the year, and share some unforgettable underwater experiences. And Sipadan really does offer it all. From the tiniest Candy Crab at Lobster Wall, White-Tip Reef Sharks at Drop Off, Hawksbill Turtles on our House Reef to a Whale Shark accompanying some of our divers at Drop Off…what a week it’s been! 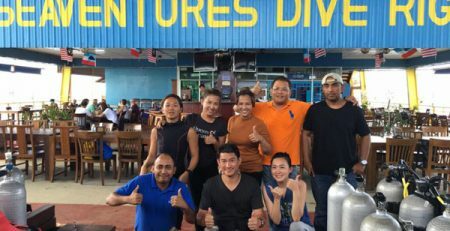 Seaventures are proud to have one of the most experienced and qualified dive teams at Sipadan. We love sharing that knowledge with our guests – so they can take amazing underwater photos or just simply enjoy being around some of the most amazing creatures on the planet. The teaching team have also been busy this week. Jeng (who is on her third visit to Seaventures! 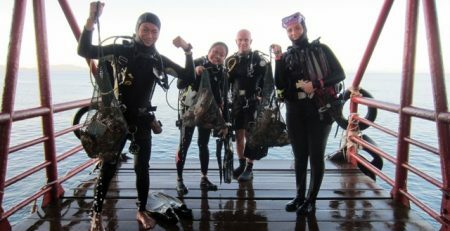 ), Jo and Adam completed their PADI Cavern Course in the world famous Turtle Cavern. This course teaches students how to safely explore caverns. See our Facebook page for some great photos of the cavern, and a video of Jeng jumping from the rig! Caverns and caves are fascinating environments but they can pose risks to un-trained divers. Turtle Cavern is the entry point to Turtle Tomb – a cave system that stretches hundreds of metres underneath Sipadan. It’s called Turtle Tomb because, sadly, several Turtles and a Dolphin have entered it and not been able to find their way out. 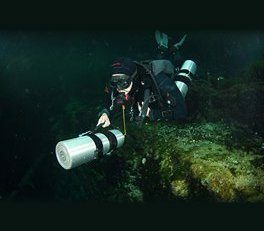 For certified cave divers, Seaventures are now offering guided dives in the cave system. Send us an email for more details on our Cavern Courses, Tec courses or guided cave dives. We would love to share this beautiful dive site with you.